Did you know that raw local honey can provide a number of benefits for your health? Before we dig into all the ways raw local honey can boost your health, it's important to be able to tell whether the honey you're buying is raw. Raw honey is often more buttery in consistency and looks more opaque (not transparent) and can have bits of beeswax in it called cappings. Honey that looks syrupy and clear is heat-pasteurized and processed - which removes the majority of the compounds and benefits raw honey provides. Also, please remember that honey of any kind or preparation should never be given to children younger than 12 months old. Now, let's get to the good stuff! 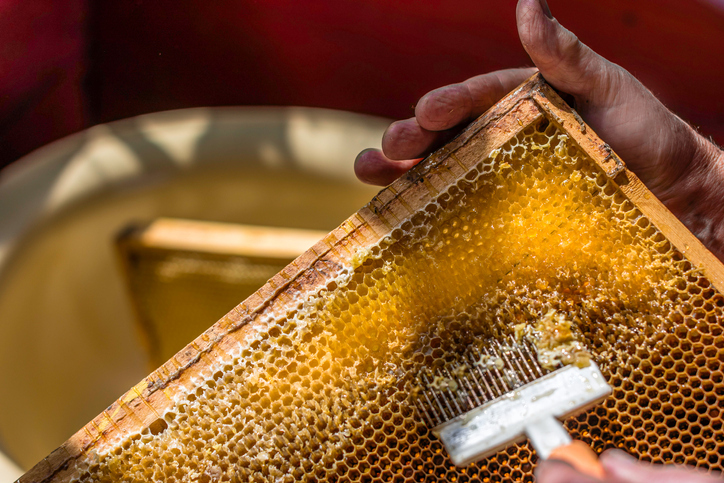 This is where making sure the raw honey you buy is local to you is key. Bees gather pollen from various plants in your area. These are the same plant pollens likely causing the immune response that results in allergy misery. The honey produced by local bees includes small amounts of those pollens that, when ingested daily, reduce the body's reaction to those pollens and help relieve allergy symptoms. Raw, local honey contains compounds that suppress coughs naturally. In fact, studies have shown that local raw honey is more effective in reducing coughing than over-the-counter cough syrups. The exact nutrients vary by area but raw local honey can provide a number of B vitamins, vitamin C, major minerals (magnesium and calcium) and trace minerals such as copper, selenium, manganese and zinc. Raw local honey is like mother nature's multi-vitamin. Local raw honey contains enzymes that can help and enhance digestion. In fact, it has been used to treat digestive ailments such as ulcers and diarrhea. Local raw honey has anti-fungal, antiseptic, anti-microbial and anti-inflammatory properties that make it an ideal treatment to help heal burns. Even some hospitals in a number of countries use local raw honey from their area to help treat burn victims. Raw local honey contains powerful plant compounds called phytonutrients and also antioxidants that can help fight cancer. Raw honey from your local area can have a number of positive health benefits. Of course, it's important to remember that consuming any product in a raw (unpasteurized) form could carry risk of food poisoning, however small. So, you want to purchase your local raw honey from a reputable and knowledgeable beekeeper to reduce risk of contamination or illness.